All of your account’s general preferences are created and maintained in this screen. This is a overview of what the general account info screen looks like. override their personal preferences with a different time zone. Username - Your username is what you use to login into your HourDoc™ account. Username must be at least 3 characters or more. Can only contain alphanumeric characters and "_". Password - Your password is your key to accessing your HourDoc™ account. To help secure your personal information, do not write down your password or share your password with anyone else. If at any time you forget your password, you can use the "Forgot Your Login" link on Login Page in order to retrieve it. You will need have your email address setup accurately in your account and your login information will be sent to you, via e-mail. Generate and email password - Please select the interval if you would like to auto generate passwords for personnel. If you would like to force users to change password manually at selected interval, you may check the Manually change password box. Before you enable this option, please inform your personnel about the change so they remember to check their email (specially SPAM folder) when they are unable to login and if they still can't login, they can use the 'Forgot Password' utility to reset their password. Activate onboarding - OnBoarding is a separate feature that requires employees to digitally sign new hire and other paperwork before using HourDoc™. This option enables OnBoarding for the account. You will need to check the "allow on OnBoarding" checkbox in the employee's general preferences to allow employee access to OnBoarding. To give managers permission to manage OnBoarding, you will first need to allow OnBoarding access at the employee level, then add manage OnBoarding permissions to the manager. Other manager options are available on the manager permissions page. Activate onboarding for all new personnel - Check this box if you want to give OnBoarding access to all new employees created in HourDoc™. All existing employees will not be affected. You can also set a specific date when all employees are created and on that date or after that date to activate OnBoarding for them. Note: Granting OnBoarding access to a new employee will force that employee to login to the OnBoarding system to complete his/her documents. HourDoc access will not be available until the employee completes the OnBoarding process and approved by a manager. Disable onboarding on finalization - Check this box if you wish to disable OnBoarding access for all personnel upon Finalization. This is useful when there is a newly added form that needs to be finalized only by new personnel. Show onboard summary on login for managers - Check this box if you want Managers to see a summary of all OnBoarding activities on their home page. Activate Benefits - This activates the benefits module in HourDoc. Activate Benefits for all new employees - When this is checked, benefits will be activated for all new hires. Work week begins - Your payroll settings are used to dictate the work week and overtime rules as they apply to the pay period and its frequency. The work week begin allows you to select at what day your work week begins to ensure payroll is calculated correctly. Work week overtime override - This sets the parameter for when the system starts calculating overtime for your employees. If your PTO policy states that OT is calculated from 40 hours, enter 40.00 in this field. Class I: 1) Overtime is paid for all hours worked between 8 and 12 hours for any given day. Double time is paid for all hours worked over 12 during any given day. 2) Overtime is paid for all hours worked in a workweek that are over 40 hours. 3) Overtime is paid for all hours worked on the 7th consecutive day. Double time is paid for all hours worked over 8 on the 7th consecutive day. Class II: 1) Overtime is paid for all hours worked between 8 and 12 hours for any given day. Double time is paid for all hours worked over 12 during any given day. 2) Overtime is paid for all hours worked on the 7th consecutive day. Double time is paid for all hours worked over 8 on the 7th consecutive day. Class III: 1) All hours over 8 in a day or 40 in a week or worked on the 7th consecutive day of a work week will be counted as overtime. In addition, hours worked over 12 in a day or hours over 8 worked on the 7th consecutive day in a week are also calculated as Double time. California state law states any organization has the power to implement overtime rules based upon terms agreed upon by both the employer and its employees. This is referred to as "Alternate Scheduling". Since this rule can vary from company to company, we've made available the most widely used rule set. It states the following: 1) All standard California overtime rules apply AND 2) If an employee works during a day that is not scheduled, they are paid overtime for the day in question. Calculate unfinalized personnel for payroll - You may enable this option if you wish to have a link to view "Unfinalized Peronnel" in Payroll. If there lot of payrolls unarchieved, please disable this option because it takes much longer time in loading Payroll Listing since all payroll status is recalculated. Auto finalize unapproved personnel in payroll - Finalizing departments require that all personnel have their time approved by a manager. In the event that an employee has not been assigned to a manager or there are no personnel pending to be approved, the system can auto-finalize that department for you making it easier to complete the payroll. This allows the system to know when your pay period begins and ends, allowing you to receive reports based upon pay period. This is invaluable when coordinating personnel time worked with a pre-determine time frame. For payrolls that rotate every 15 or 30 days, please provide what day of the month your payroll typically starts. If your payroll is every two weeks, then at the time you are creating a schedule in the Scheduler™, you have the option of specifying whether or not that schedule marks the end of the payroll for the time span specified. NOTE: Due to the nature of there not being an equal number of weeks in a year, there may be a few occasions our indication of your payroll starting and ending does not match with your actual payroll. Until we can determine an appropriate solution to this problem, please be aware of this potential problem. Calculate all the hours up to shift end - This function calculates all the hours of people when they end their shift, rather than when the payroll ends. Ex: 7:00 pm - 7:00 am would all show up on the payroll rather than splitting the entry into 7:00 pm - 11:59 pm and 12:00 am - 7:00 am. NOTE: Your Client number/code and Employer ID is assigned to you by your payroll provider, if you are using one. Scheduler Settings deals with your day off request and how/if your employees can use these features. Enabling these settings can let your employees request days off and sent to a manager to be approved, edited or declined. These settings will also allow you to have the day off requests automatically approved and/or disable the feature if the employee does not have enough vacation or PTO. Scheduler settings are located in your Preferences > General Account Info page on the left hand column. Allow users to request days off--Enabling this option will allow your employee's to request days off from any computer that allows them to access to their account (IP controlled access). If you enable this option please be sure to set up your "Day off Accrual" settings. Day-off request are automatically approved--This option can be enabled to help reduce the micromanaging of managers in HourDoc. Once checked though, employee's will not require managers to approve their time off, meaning there could be a possibility several employees could ask for the same day and all be approved. Enable day request to be applied to following payroll--If enabled the days off hours will not be paid until the following payroll. Disable days off for employee's on finalized payroll--Once a payroll has been finalized an employee will no longer be able to request time off until the next payroll has began. Enable days off for employees with zero balance as unpaid hours--Enabling this option will allow employees to request time off once they have used all of their vacation and PTO but mark them as unpaid. This will allow employees to request off but as UNPAID time off. Auto-Post Schedules - Enabling this feature allows you to automatically post schedules, you then don't need to go in each day/week/month or year(depending on how your shift is set up) to post a schedule. NOTE - The schedule will only be activated once you click on the "Post Schedule" button. This feature does that for you. Activate usage of mobile devices for remote time tracking--Selecting this option will allow employees to login to HourDoc using mobile devices (Android, iOS, etc. This does not enable employees to clock in/out, as that setting is controlled on a per-employee basis and is setup under an employee's general preferences. Require time entries to be approved by personnel--Enabling this option will require personnel to approve there times before a manager can finalize payroll for a particular department. Display timecard on employee's dashboard--This option will show what time the employee has worked during there current pay period on their dashboard. The screen shot below highlights the differences in green. Display Wage in timecard--Checking this box will calculate for the employee's how much money they have earned this pay period. You can see the selection in the above screen shot highlighted in blue. 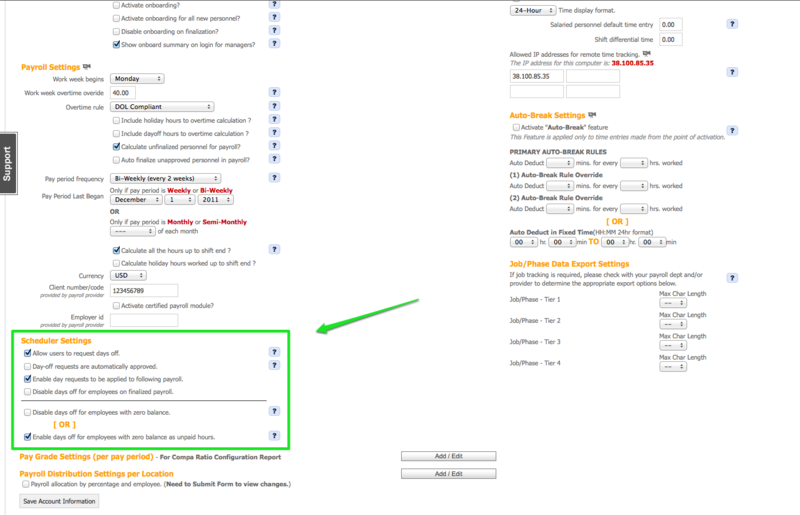 Show SSN in payroll status--Some payroll company's require SSN instead of employee ID numbers. When this is enabled the system will search through the employee's in the given payroll and notify the manager if any employee's don't have a SSN in the system. Show Notes in the "Print all time sheets Page" - This allows you to view your notes about this entry in the time sheets page. View piece rate in time entry - Piece-rate pay gives a payment for each item produced – it is therefore the easiest way for a business to ensure that employees are paid for the amount of work they do. Piece-rate pay is also sometimes referred to as a “payment by results system”. Enable Supervisor Approval - If you have supervisors approving time for employees, this feature set a permission that the supervisor need to approve the time entry before a payroll can be finalized. Show time entry errors to employees--Provides a way for employees to view previous errors in their punches. If an employee worked over the excessive time threshold, or forgot to clock out one day, the system would show an Excessive Time Entries box. The employee would then know to speak to a manager to get the entry fixed. Notify personnel on time entry approval--Works in conjunction with the "Require time entries to be approved by personnel" checkbox. If that is selected, this option will also notify the employees upon logging in that they need to approve their entries. Require re-approval of time entries if modified after initial approval--If a time entry is modified after initial approval, the system will again ask to approve the time entry. Highlight breaks in timesheet after "[ X ]" mins.--This highlights breaks on an employee's timesheet if they exceed the number of minutes entered. Use '0' if you do not want to use this feature. Allow Break IN & Allow Clock OUT - These setting work more or less the same. They allow you to set a parameter so that the employee can only clock out for break after a certain amount of mins clocked in for work, the employee can only clock out after certain amount of mins clocked in for work. "[ X ]" Hours tracked per time entry before flagged--This settings flags entries that go over the specified number of hours.. If you have an 8 hour work day then you might use 9 hours in this field. Any employee whose time entry goes over 9 will have that time entry flagged. The flagged entries appear on the manager's homepage as seen in the screen shot below. "[DATE]" Start Date for tracking excessive time--This options works with the "Hours tracked..." option above. If you want to flag time entries as of a specified date, fill that date in here. Time entry rounding options--In certain circumstances, the Department of Labor (DOL) allows for time entry rounding of 1/10th hour or 1/4 hour rounding. For specific details please consult your HR advisor. Round break time--This will automatically round break times according to the time entry rounding option set in the above preference. WARNING: ROUNDING BREAK TIMES IS NOT PERMITTED BY THE DOL. Enable Shift difference--Please contact a HourDoc.com representative if you or your company is interested in enabling this option. Time display format--Here you can adjust how the employee's will see there time format. You can set it either on 24-hour format (military time), or 12-hour format. Allowed IP addresses for remote time tracking--If you have activated TimeTracking utilities you will need to input the IP addresses from the computers that employees will use when clocking in and out. To find the IP address you can use a site like ipchicken.com (HourDoc is not affiliated with and does not endorse content of such sites). Once you have the IP address you will enter it in to one of the boxes, as seen below. The security that HourDoc uses to keep employees from clocking in off site is controlled by the Allowed IP addresses. If you log into your account from your network, the red numbers represent the IP address of your network to the outside world. Once that number is placed in one of the boxes, anyone “inside” of that address will be allowed to clock in. You may add up to 12 IP addresses. Placing an asterix at the end of the set allows for a range of IP addresses. Please contact your network administrator for more information. If you find that your employees have a tendency to forget to indicate if they have taken a break, the Automatic Break Deduction feature has been designed for you. This feature has the ability to record how many minutes should be deducted from a user's time entry after the determined number of hours has passed. When the employee does however enters a break the Allow Manual Breaks will then ignores the Auto-Break Rule and enters the manual break for the employee. Select how many minutes you want deducted for every X hours worked for up to a 24 hour period. When you review the time entries, each transaction will be labeled as an auto deduction. Also, multiple breaks will be deducted if the conditions are met. For example, if you are deducted 30 min for every 3 hrs worked, if the employee works a 6 hour shift, he/she will receive two 30 min breaks. Because of this, care must be taken in determining how much time is worked before a break is taken. Generally, if an employee should receive a 30 min break on one eight hour shift, you would set 30 mins deducted for every 5 or 6 hrs worked. In order for an employee to have his breaks auto-deducted from his/her time entries, go to that users preferences and flag them as such by checking the "Activate Auto-Break feature" box. NOTE: HourDoc.com™ performs all auto-break deductions at midnight. In other words, if you have either updated or activate your auto-break rules for the first time, you will be able to see those rules applied to your time entries come the following day. NOTE: The use of the Automatic Break Deduction feature is done so at your own risk and in no way does HourDoc.com™ retain any liability for any potential employee litigation related to this feature. HourDoc.com HIGHLY recommends the placement and enforcement of company policy that would specify the requirement of all employees to manually enter his/her break time. If you have any questions or concerns in relation to this warning, please contact your sales representative as soon as possible. Jobs/Phases, can be set up to allow your personnel to receive different wages depending upon the job being performed. Currently HourDoc™ supports a primary job with three levels of sub-jobs or tiers. This allows your organization to set-up the following structure if so desired. For our example, we will use an automobile repair shop. This structure would allow the manager to set-up a certain employee so that when working under General Maintenance they would be paid $10/hour but when working under Clean-up to be paid only $6/hour. HourDoc™ can not only track time and wages, we can also track the appropriate amount of overtime to be paid based from the Fair Labor Standards Act as set forth by the Department of Labor. Jobs/Phases should only be used if your organization requires different wages to be paid according to the job performed. If the wage to be paid is a non-issues, we recommend you use the Location/Department structure. Since some payroll providers require not only a specific code, but a code length as well, the "Export Code Length" field allows you to define what those parameters are for each tier in your organization. If you have no need to define the Export Code Length, simply set the length to the maximum allowed value for each tier. Remember to click the "Save Account Information" button when you are done.